Due to be launched on QVC on the 10th July (that’s just a few days away! 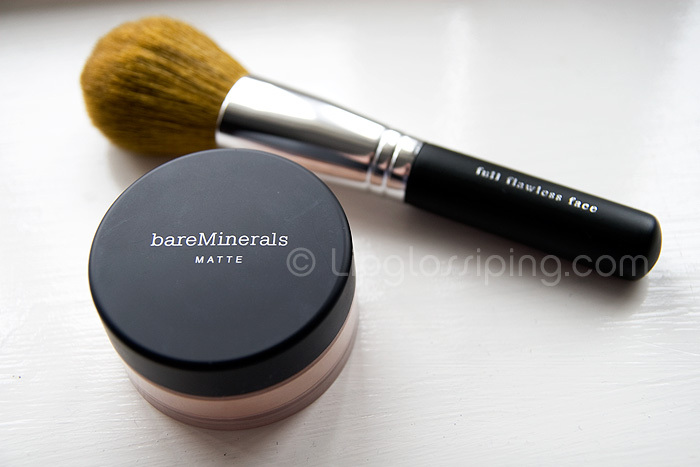 ), Matte is the latest foundation to be released by mineral foundation pioneers Bare Escentuals. Available in 15 shades to suit every skintone, I purchased my pot of Bare Escentuals Matte SPF15 (shade: Fair) in a blog sale a little while ago and have been putting it to good use in the warm weather we’ve recently been enjoying. Just as finely milled as the original version, the foundation feels silky and light to the touch. 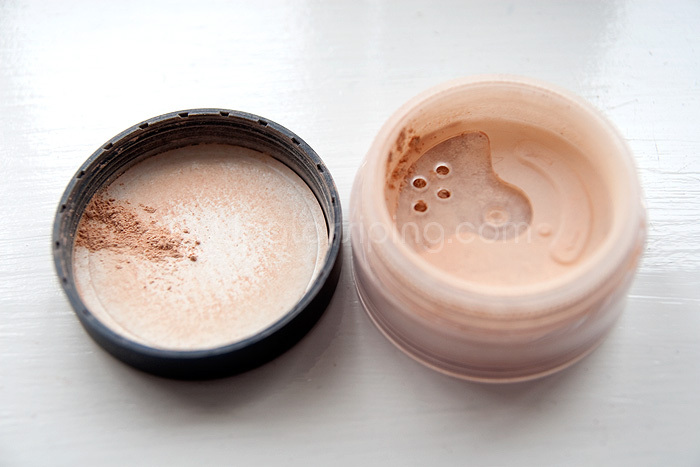 I’m starting to realise there’s a bit of a love/hate vibe around mineral foundation. I will happily swear by the coverage it gives and I rarely get a cakey finish when wearing it. Infact, I’ve often (ok, twice) been asked what foundation I’m wearing when shopping on beauty counters and both times when I’ve replied with the answer ‘mineral’ – the look of shock from the SA’s has been in “kodak moment” territory. As with the original Bare Escentuals SPF15 foundation, I’d call this medium coverage. You *can* build, but that’s when you begin to run the risk of it looking more obvious, especially on dryer skin. You can purchase fuller and more sheer mineral foundations, it all depends on the ratio of the minerals, but Bare Escentuals in my opinion, offers straight down the line medium coverage. A little rotating lid like you’d find on your pepper pots covers the holes in the sifter and stops excess product leaking during transportation. I told you it was simple! Application is the same for the new Bare Escentuals Matte foundation as it is for the original. Swirl, Tap, Buff! Mineral still affords me the quickest and most forgiving of foundation applications. I have a few great brushes for application: My Body Shop kabuki, my MAC Flat Top 180 or my Bare Escentuals Full Flawless Face Brush. They all work equally well to provide an even finish, though flat top brushes tend to give a fuller coverage. I’ve talked about application, packaging and my experiences with mineral foundation in general… let me tell you how I find the new Matte version in comparison to the Bare Escentuals original formula. On initial application, it is indeed a completely matte finish (thanks to additional oil-absorbing minerals)… it wipes out all traces of shine and oil from my skin, leaving a wonderfully even surface. The original leaves me with a touch of…. not sparkle, that’s comletely the wrong word. Natural luminosity? I would say that if you have more mature skin, you may prefer the more forgiving finish of the original formula. If your skin is younger and more prone to oil… the Matte formula is something you should definitely try. Alternatively, something I’ve had success with is wearing my original formula lightly all over before buffing a little Matte into my T-Zone. I’ll share a little tip that SJ (Bare Escentuals National MUA) told me when I was introduced to the new foundation. If, in the middle of the day… you think you need a little foundation touch up, grab a brush and simply buff your face with it (no product). It re-distributes the minerals that are already on your face from the initial application and simply recharges your foundation. It totally works and is something that I’ve always done with minerals anyway… but it seemed funny to hear a proper MUA confirm something that I do without any thought as to why or how it works. Silly anecdote, but a tip is a tip! Longevity? Well… that’s my other bugbear with mineral foundations. It’s a shame that I have to take a brush and buff my face in the middle of the day… but I do. Bare Escentuals Matte foundation is no different and generally lasts about 5 hours on me before I need a pitstop to the Ladies with my brush in hand to ‘redistribute’ the powder. Then, I probably get another 3/4 hours out of that before I wanna apply more product. The nature of the product however, means that it doesn’t matter if I apply a bit more over the top of the rest of my makeup. It has no ill-effect at all and now that Bare Escentuals has made it portable… well, it’s just not much of an issue for me anymore. Worth mentioning though. Overall, it’s not an improvement on the Bare Escentuals Original foundation (bar the new sifter)… but it does sit very nicely alongside, offering an additional choice which may or may not be for you depending on your skin type. Bare Escentuals Matte SPF15 Foundation will launch on 10th July exclusively on QVC priced at £19.50. Are you a mineral foundation lover? Thanks for the heads up on the Collection 2000 one, is the shade range good? I’ll have to go and have a look. I totally agree, I get amazing results from mineral foundation but it’s just not raved about much! Just having a read for you…. From August it will be available exclusively at Selfridges and Selfridges.com and then from September… rolling out to their other retailers. You can buy a whole range of bare escentuals products at http://www.feelunique.com and everything is free delivery with no minimum spend plus they have some great prices on kits from bare escentuals! I love FU’s free delivery… so refreshing! Even though there are now quite a few mineral foundations on the market in the UK, I don’t understand the stigma with minerals. I love mineral foundations, especially for my acne-prone skin, with Everyday Minerals being my fave. I have tested BE but find that I have to mix two colours together to get the right shade although I do love the natural finish it gives. There’s so many independent mineral companies that it boggles my mind! I do love Cory Cosmetics for their fuller coverage too! 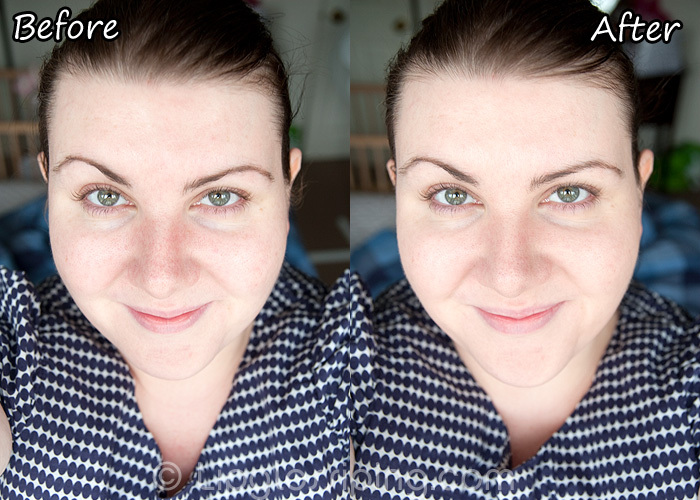 I’ve only used one mineral foundation, from BFTE and i was amazed as it was so much better than i was expecting. In fact it’s probably the best foundation i’ve used and so easy to apply! I love the new packaging on this, i hate when the powder comes out of the holes and you get a big load of product wasted. I think mineral foundations to surprise people once they get round to trying them! Oh god yes, nightmare packaging… this is such a simple solution too! i lovelovelove mineral foundation! it’s part of my everyday routine. i had great luck with the BM foundation before but, like you mentioned in another post, it was one of those products that i loved but “stopped working” for me. so i switched to laura mercier and i must say, it’s divine! it feels creamier and silkier than BM and has better coverage (for me). it comes with a sifter as well! i can’t say anything about longevity though as i’ve never really needed to re-apply with either product. This sounds like the perfect foundation on my super oily skin tone! Great review! Love this stuff! I use the original formula in Fairly Light and it’s so nice and smooth. I like a light-medium coverage too so it’ll last me an age. Yes, it does seem to last forever doesn’t it! I also LOVE mineral foundation, and mineral make-up in general. Right now I’m using Meow’s Pampered Puss formula, and it’s awesome! My skin is pretty sensitive, but this one works like wonders for me. Plus they have like more than 80 colours, it’s crazy! Would the coverage of this be good for covering freckles ? I love Bare Minerals. Been using it for over 8 years! Only thing is I keep spilling it because too much power gets caught in the top part- other than the container design, I love it!